Despite it being my daughter's birthday last Thursday, I managed to be at the singing and candle blowing out part of the celebrations and was then surplus to requirements, and was very pleased I had managed to hear Chris's talk on Silbury Hill, he's such an enthusiast and knows so much about neolithic features in the landscape. He also has been associated with Avebury and Stonehenge since 1991, and now looks after 241 National Trust volunteers. What we learned was that Silbury Hill is the largest man made mound in the world in the prehistoric period, it's the most labour intensive as well, 500,000 tons of chalk were used in its construction between 2400-2300BC. It sits in the centre of a Roman complex and was probably constructed in the area because there are 187 springs around Avebury providing water for the settlements. It is thought it was possibly built for ceremonial or religious reasons, but this is pure speculation, no one really knows for certain why Silbury Hill was constructed.but there are no artefacts inside. The Anglo Saxons cut the top off Silbury Hill to make a fort, it measures 70 feet across, and is 36metres high and the base covers 5 acres. 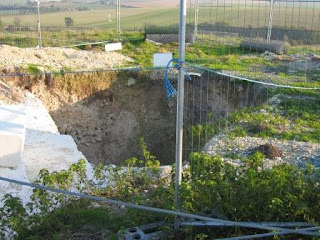 Excavations have been made into Silbury Hill to find out what is inside and maybe gain insight into why it was built. Firstly in 1776, Cornish miners drilled a hole into the top, then in 1849, John Merryweather tunneled into Silbury Hill; this was repeated in 1968 when a 250 foot long tunnel which was 6 foot wide and 8 foot high. The BBC hoped it would become a tourist attraction, but English Heritage wanted it filled in. 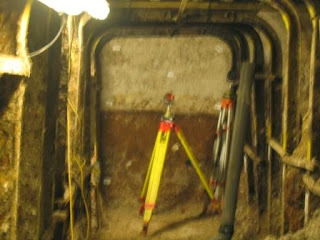 The tunnel was poorly filled in leaving voids in 1968. There are very few Neolithic finds, as is the case with the stone circle, these sites are called 'clean sites' because of this. Dating for the completion of Silbury Hill as 2300BC came from the finding of a strategically placed antler; there are artefacts from the Roman and Anglo Saxon periods. It has now been restored and is now stable and should stand in the landscape forever. Many thanks again to Chris for coming in to give us such an interesting and informative talk, and thank you very much Chris for the great photos of the tunnel and the collapsed top of Silbury Hill. Join Friends of Swindon Museum & Art Gallery on their monthly talk for October, Saving Silbury Hill by Chris Penny. Chris Penny from the National Trust will talk about the partial collapse of Silbury Hill. The 131 feet high man made mound that survived intact for 4,500 years before tunnels dug by treasure hunters and archaeologists weakened its structure. His talk will cover how the weaknesses were analysed and how it was repaired in time unlike its neighbour at Marden Henge which collapsed and disappeared 200 years ago. Erik Burnett-Godfree will talk about some of the best paintings currently on display in the Art Gallery. For those of you who remember his weekly lunchtime talks at the gallery, during the 80’s & 90’s, this is an event that should not be missed as he brings to life the backgrounds and techniques to the paintings and shows how the artists set out to inform and entertain us with their work. Erik has also worked as director of Swindon Arts, Co-ordinator for the Big Screen and as a reporter for BBC Wiltshire. The talk will be preceded by the AGM of the Friends of Swindon Museum & Art Gallery which will start at 7pm.